It was a relaxing Saturday when we checked out one of the must see historical museums in Cebu, Philippines, the Museo Sugbo which is also known as the Cebu Provincial Museum. The Museum complex is steep in history that dates back to the Spanish Occupation when it was officially called the “Carcel de Cebu”. “Carcel” is a Spanish word for “ prison ”, hence, it is the place where authorities incarcerated the lawbreakers during the Spanish period. After WWII, this place continued to be a jailhouse. But in 2008 the provincial government of Cebu transferred the Cebu Provincial Detention and Rehabilitation Center (CPDRC) to its new location in Kalunasan and converted the complex to what is known today as Museo Sugbo, the biggest museum in Cebu. Museo Sugbo is a very important institution in the province and a must visit for tourists and visitors coming to Cebu who wants to know Cebu more intimately. 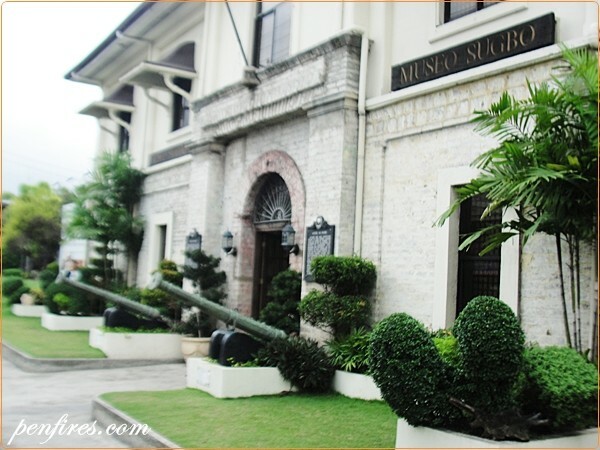 Visit this museum and learn about Sugbo’s rich heritage and history through the galleries and chambers that houses artifacts, antiques and memorabilia from Cebu’s past. Many of these museum pieces are on loan by private individuals and institutions or donated by them. Kudos to them for sharing their treasures to the Cebuanos and to everyone! There were students out on a field trip to this Cebu museum when we got there, the school bus was a giveaway lol. If you want to have a Cebu City Tour on a shoestring budget, you can definitely include visiting this Cebu tourist attraction without fear of spending much. You can check out this handy guide on how to take jeepneys to Museo Sugbo. Museo Sugbo is open every day except Sunday from 8:30 am opening time to 5:30pm closing time. I met some students who were visiting the Cebu Provincial Museum on their own, without instruction from their teacher to come and check out the place. I asked them why, they said they want to know more about the province’s history. Yes they have an assignment but they could just as easily Google for info but am really glad that they took the time to visit Museo Sugbo. Am proud of these kids! At the entrance you will see a pair of elaborately detailed canons. The details looked like Chinese to me similar to symbols you see in Taoist Temple like the dragon. What do you think? There is also this fountain after you pass by the gate, I wonder if this fountain was already in existence when Museo Sugbo complex was still a jailhouse? Somehow it doesn’t fit a prison complex so I’m betting this was introduced during the renovation of the complex. It will probably take you more than 2 to 3 hours if you will check out all chambers as leisurely as we did. Please take your time, don’t hurry. Appreciate the things that you will find, know that a lot of people care enough to share their own collections to everyone and a lot more people put in work to make all exhibits possible. Going to a museum shouldn’t be a boring task that you must comply because your teacher or your school organizes a field trip as a requirement for you to pass your subject. Visiting museums is also not just an opportunity to take pictures as souvenirs and show them to your friends, that yes you have been there. Museums are windows to our past. A nation, a province, a city can’t have meaningful progress if its citizens and residents forgets about its past. There are lessons from the past that if reflected on can teach us a thing or two that helps make our future brighter. Please visit a museum when you are touring a new place, visiting a new city. Museum tours are the best way to know a place and its people more intimately. Please do this. And when in Cebu, check out its largest and biggest museum. Unsa pa but ang Museo Sugbo! I was also happy to note that some of the security guards can also double as tour guides for they know the artifacts history. Special mention to the guard on duty at the National Museum Branch Galleries last September 8, 2012, thanks Mr. SG! And yes you can have your picture taken at the same time expanding your mind, knowledge and appreciation of the past. On a lighter note, I didn’t know makikita ko ang peg ng damit ko for the day haha. This museum in Cebu houses different chambers, each showcases a different period in Cebu’s history. There are permanent galleries and temporary exhibition halls. You can take all pictures that you want (without using your camera’s flash) in all galleries except the gallery exhibit being managed by the National Museum. This was my favorite chamber and no one was allowed to take pics. Sad 🙁 but yes I know this must be for a reason and that I respect. So well let me content myself in encouraging you not to miss the National Museum Branch Gallery (Cebu) when you visit Museo Sugbo. A hot day is also not an excuse to skip visiting this famous museum in Cebu because all exhibition galleries are air-conditioned and yehey, wifi is available! As you pass the fountain you will be welcomed to a huge open quadrangle. This area used to be the venue for the performances of the famous Cebu Dancing Inmates. *When we got there it was super hot, but after a couple of hours, gloomy skies prevailed. *Millet grains or Kabog – Traditional grains grown and eaten by early Cebuanos. Budbod kabog is a popular Cebuano delicacy that uses these yellow tiny millet grains. *Golden Tara of Agusan – this one is my favorite artifact replica. The real one can be found in the Chicago Field Museum of Natural History. I wonder if there will come a point in time when this 13th century artifact will be brought back to the Philippines. *The War Memorabilia – One of the depressing chambers simply because it showcases the years when the Philippines and Cebu were under the Japanese during World War II. It maybe depressing because you can see bayonets and you wonder how many babies, how many wombs, how many stomachs it was used on. You can also view bomb, antique machine guns, bullets, rations, military uniforms and more. But despite seeing these sad artifacts, visitors will also see in this chamber the medals that tell of courage, heroism and selfless service. A reminder that there were courageous men and women who fought for the freedom we enjoy today, and that they shouldn’t be forgotten. *Emergency Currency paper bills used in the war years, issued by Philippine National Bank in 1941. If this currency is found in your possession by the Japanese and Japs puppets, you’ll be in deep, deep trouble. * Museum of Philippine Political History (MPPH) – The gallery where you can find the political development of the Philippines and the important events that shaped the country. You will read here more of our well known national heroes including the women who served during the Philippine Revolution against Spain and America. *Election Propaganda Materials – Because election is coming next year 2013, I’ve chosen to includethis picture of an old election campaign material of then candidate for President Manuel Quezon and Sergio Osmena who was running then for Vice President. *Handumanan Collection of Visayan Saints – This gallery showcases the antique collections of Bisayan Santos by Rosita Arcenas. I will be writing a separate article on this, please watch out for it. I’ve mentioned that my favorite gallery was the Cebu Branch of the National Museum. I like it best because it exhibits the artifacts excavated from the Plaza Independencia area during the construction of the SRP Tunnel. You can see centuries-old china wares like plates and lots of porcelain jars, there are also Thai and Vietnamese ceramics and artifacts. You can also check out the exhibit of different artifacts recovered from the warship San Diego. This galleon was originally constructed to be a trading ship with original name San Antonio before this was converted to a war ship. Unfortunately, this galleon / war ship sunk in the waters of Nasugbo, Batangas without firing any single shot from her canons against an enemy war ship of the Dutch called “Mauritius“. When she sunk she took with her all her cargo. There are coins recovered from San Diego which are still clustered together due to the centuries of being under the sea. These coins are waiting to be ‘cleaned’ up, you can check these coins in this gallery branch of the National Museum of the Philippines. You can also see the famous death mask made from thin gold sheets with etching; this is one of the most important finds from the Plaza Independencia excavation. Another prominent artifact is the skull of a pre-colonial native characterized by a flat forehead section. A flat forehead was a mark of beauty in the olden days. Again, don’t miss visiting this gallery when you tour Museo Sugbo. Lest I forgot, the buildings in the complex used to served as the Cebu Provincial Jail. Because of this, the buildings are surrounded by high fences and thick walls. Wala lang mention ko lang usab so I can post this last pic hahaha. Thanks for reading this another long post from Penfires. 🙂 Hope this was useful to you! You can like Penfires on Facebook or follow Tweets @penfires to be updated with new post. Please hit ‘Like’ if you like this post. Daghang Salamat! Hi, I learn a lot and most of your posts about cebu. We’ll be visiting cebu and I am checking out places to visit. Thanks to you and really appreciate each posts. Really excited this week because Sugbu here we come. Haha I finnaly knew what sugbu means, I always see it at other blogs. Thanks tho’. Thank you Sarah for reading. =) Your comment warms the heart and inspires me more to blog about Cebu. =) Enjoy your vacation sa Syudad sa Sugbo!